As a little girl, I derived insane amounts of pleasure from rummaging through my mother's makeup case. Lipstick, rouge, eyeshadow, mascara ... whatever I could find, I put on my face immediately. As I grew older, this love of makeup turned into a complete fascination with makeup kits. I would spend hours at the drugstore, wistfully looking at the cases of 12 lipsticks, 14 eyeshadows, 6 blushes ... well, you get the picture. My mother knew this, of course, and would buy them for me each holiday season -- always eliciting the same squeal of delight and ear-to-ear grin from yours truly. And as a beauty writer today, I still remember that feeling every time I open up a new product, see that brand-new lip gloss on the shelf, or inhale a whiff of the latest perfume. 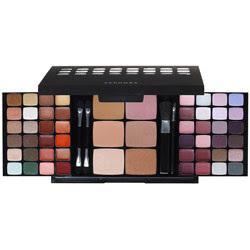 Imagine my surprise and delight when I came across Sephora's answer to my prayers -- the Summer Blockbuster Palette. Open up the matte black case to discover 24 eyeshadows in every shade imaginable, from glittering teal to shimmering mauve, sparkling peach to barely-there taupe. Interspersed among them are 24 lipglosses, encompassing everything from intense ruby red and glitter-tinged clear to luscious apricot and rich plum. And just when I thought it couldn't get any better, I realized that the case contained a second layer underneath! Sliding the lipglosses and eyeshadows apart revealed six blushes for varying skin tones, two double-sided eyeshadow applicators, a blush brush and a lipgloss brush. And no kit would be complete without an attached makeup mirror -- so, of course, Sephora included that too.